I really hope a grief wave can't get me from here. An excellent friend of mine described grief as coming in waves, with times when there is less grief, and other moments when it absolutely seems to cover you. I'm slowly coming to the realization that my grief is complicated, and that this smart friend might be right. I think my grief is complicated because I'm combining two things- I miss Dad so much and it seems like a thousand years since I've talked to him, and Mom is slowly leaving us as well. I'm creating a life without my parents' input, advice or support. As sad as that makes me, it's also been a healthy thing to turn a bit of a corner from just constantly longing for this hole to be filled. But my sadness so often continues to be for what "should have been". This is another favorite move. When I think I'm relaxed and then realize my hands have been clenched for 20 minutes. Is it impossible to be grieving when something is still happening? I find that my philosophy on things tends to be something like, "I'll just get through this and then I'll worry about the emotional impact later". But this doesn't hold up well when someone you love has a degenerative, terrible disease because there is no point when you are "through it" and safe on the other side when you can let your guard down. The process is too long, and too difficult and even when I think I'm dealing with it, I'm gritting my teeth and making something my four year old calls "worried face". How could you not remember this guy? Alzheimers and Dementia are a different grief. Dad dying was so final. He was here, then at 3 am, he wasn't. Mom is different, she is still here, but also has been gone for a while too. She looks at me and at points I'm not sure she knows who I am. We had dinner together on Friday and my husband arrived late. She looked at him with this blank stare and seemed genuinely surprised that he was going up to give her a hug. He did anyway, with the confidence and reassurance that she took cues from and was able to relax, maybe just assuming that she knew him. But I've been stuck recently, trying my best to ignore how I feel about Mom slipping further away from me. 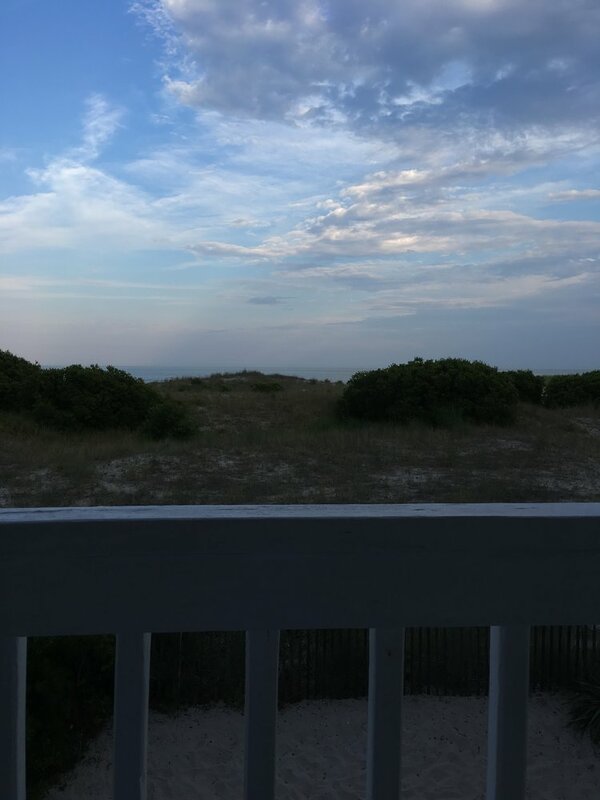 After our trip to the beach recently, I felt myself just shutting down about Mom. I didn't want to talk about her again, my last post about my neighbor's having more fun than me was super awesome, but when husband read it he said "With everything going on, I'm surprised that wasn't deeper, and sadder". Well damn. It's usually nice to marry someone that knows you so well. Except when they call you on your crap. So I had a great talk with my counselor (more on the benefits of counseling soon). And she asked me to make three changes. She asked me to monitor how I'm feeling to see if it's slipping into depression, she asked me to be honest with husband about how I'm doing (still really difficult) and she asked me to find a daily release to try and get some of this sadness/grief out. My most recent "smoothie". I'm pretty sure this is not what the health blogs were talking about. You want the recipe? Ok! Frozen banana, cinnamon, a dash of almond milk (for health), cocoa powder. 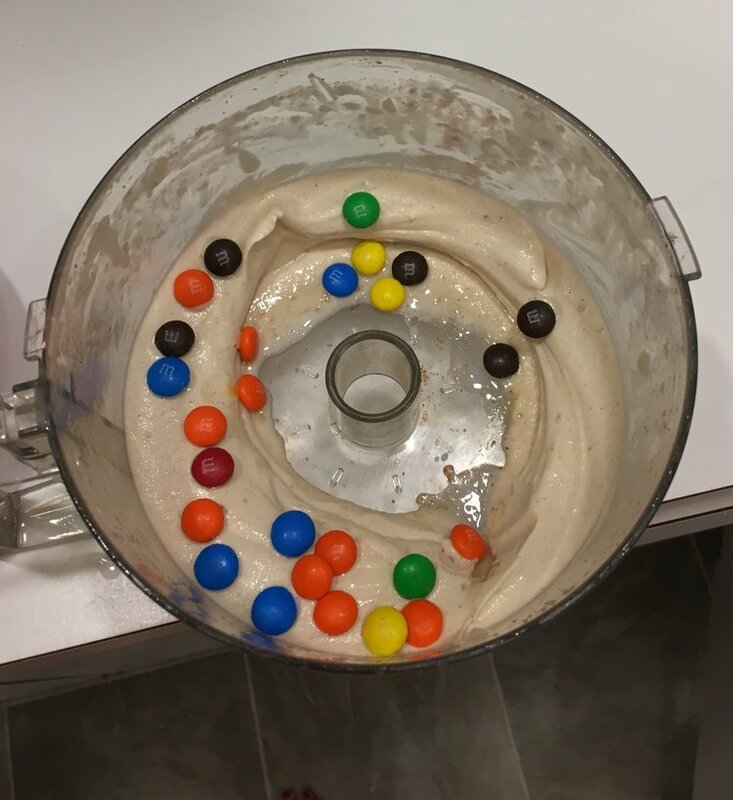 Blend in food processor. Add M and M's. Sprinkles or chocolate syrup would also work. So here is my thought process for a daily practice that will help. First I thought I was going to attempt to work out for 100 days straight. But after 11 days I missed a day and then felt like a failure and realized that pushing myself harder was not the secret to success. Neither was a crazy diet involving juices and anger. (Because drinking only juice would 100% make me angry). Then I thought that if I did yoga every day I might find some sense of peace and also some sick arm muscles. Probably true, but fits too much into the idea of fixing things, and not at all into the idea of getting closer to acceptance of where things actually are. You see, so much of my struggle with Mom is that as soon as I get okay with her decline, as soon as I can come to grips with her not recognizing my voice over the phone then she goes and drops a level and forgets my husband in person. And I'm derailed again, thinking "How can she not know him? He is her advocate, he cares about her so much and makes it possible for me to have the time/energy/brain power to be here." 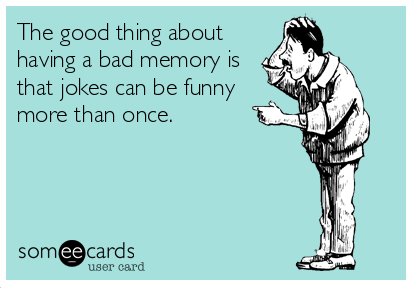 While Dad would have hated Alzheimer's as much as we do, he LOVED telling jokes over and over! So instead of yoga, juice anger or demanding a daily work out, I'm trying meditation. I started today, day 1 of meditation. I downloaded Headspace, I watched the two minute tutorial and then I sat and breathed for 3 minutes. Three minutes! I'm practically levitating at this point. Speaking of which, Mom and Dad both told me they once saw their yoga teacher levitate. True story. I don't know if meditation will be the thing that will provide some release and let me get some of these feelings and sadness out. But I'm in it for the next 9 days. Drew those hearts by myself. I think what's different now, 3 years into this new life, is that I'm trying even the things that make me a little uncomfortable. I can recognize when I'm out of sorts and instead of filling my head with "The Girlfriend's Guide to Divorce" and Cabernet, I really want to sit with how I'm doing and try to get closer to feeling joyful, optimistic and hopeful. Plus, I've already watched all of the episodes of that show in the last two months. And I'm out of boxed wine.